There’s no need to choose between a sweet treat or a salty snack with this Sweet and Salty Bark! 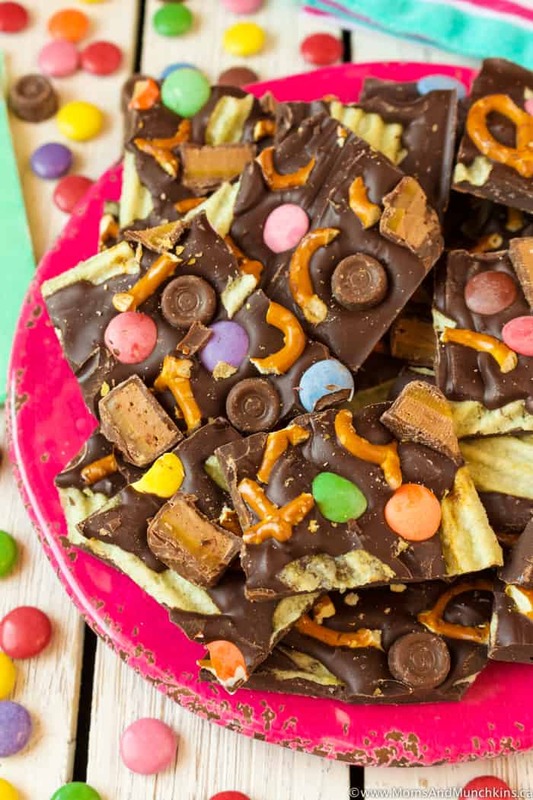 It’s a chocolate base topped with a variety of ingredients like candy coated chocolates, pretzels, caramel chocolate bars, even potato chips! Potato chips with chocolate? Yes – trust me on this! I thought it was weird at first too when I heard that someone snacked on potato chips with chocolate chips but I totally understand why now. So yummy! 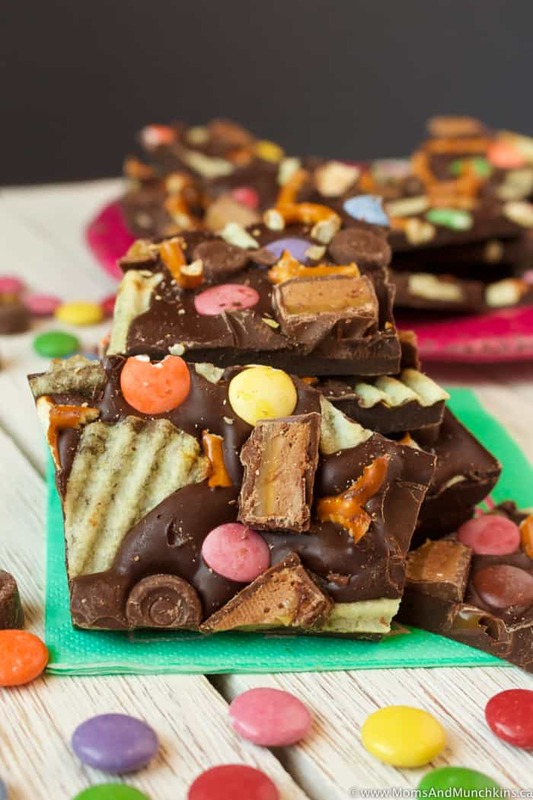 I’m not sure you can really call this a recipe – it’s just chocolate topped with all your favorite candies and salty snacks – but I’ll write it out in a recipe format anyways. Pretty sure we can call this the world’s easiest recipe! Melt semi-sweet chocolate chips in microwave on 30 second intervals - stirring well after each 30 seconds. You want this melted but not hot. Spread chocolate evenly over wax paper. 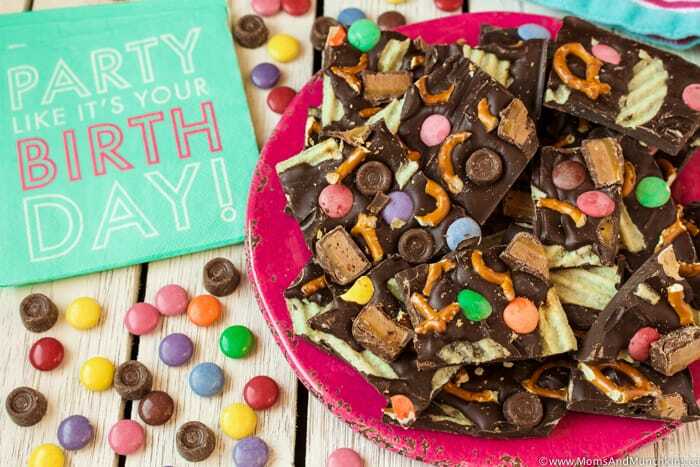 Sprinkle pretzels, potato chips, chocolate bar pieces and candy coated chocolates over the melted chocolate. Lightly press all the toppings into the melted chocolate. Place bark in refrigerator for at least 20 minutes until chocolate has hardened. Once hardened, break into pieces and store in a sealable food storage bag. Store in refrigerator. 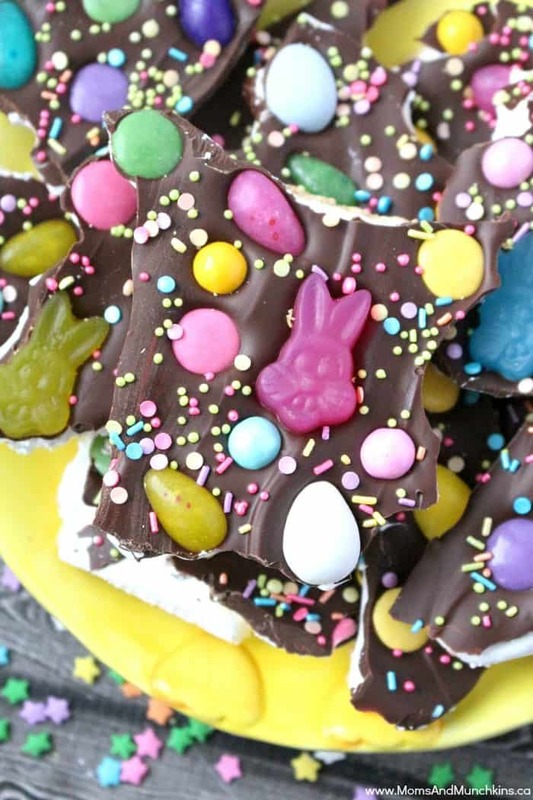 For another delicious chocolate bark recipe, check out this Easter Bark with layers of graham crackers, marshmallow fluff, chocolate and all your favorite Easter candies. For more delicious ideas, visit our Recipes page. Never miss an update by following us on Facebook, Instagram, Twitter and Pinterest.